In the quest to capture a boat on video, I realized how little I knew about boats. I did know however, to visit BoatNerd.com to check the passage schedule of boats going up and down the Detroit River. I learned of the site from the blogger over at Michigan Exposures. After checking the schedule I headed over to Belle Isle near the Dossin Museum to go boat watching. But, what are these huge boats that glide effortlessly down the river? Are they barges, ships, freighters, vessels? How about "self-unloading bulk carrier"? 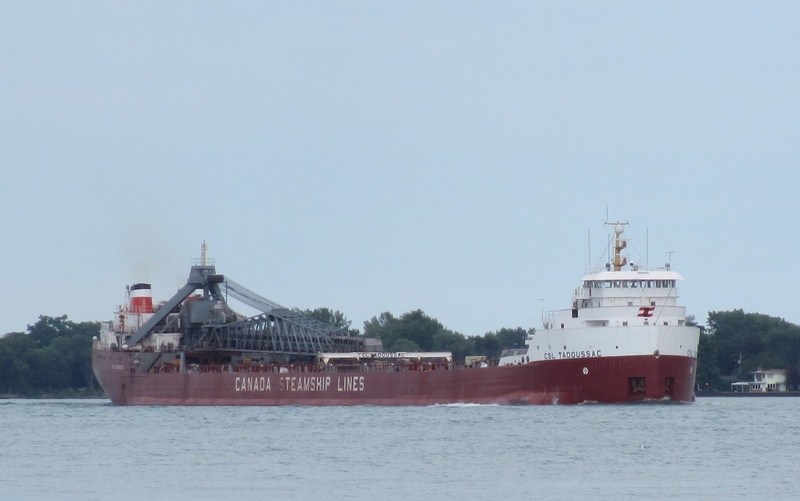 The boat on the following video is the Tadoussac from the Canada Steamship Lines, and on the spec sheet she's called just that, a self-unloading bulk carrier. The ship can carry and deliver cement, iron ore and coal. And in case you're wondering she's 730 feet in length. Okay, so it may not be for everyone, but boat watching on the Detroit River is actually an enjoyable activity! You have time to hang out, soak up some sun, watch the sea gulls and just relax as the river flows by. So I guess that makes me a Boat Nerd, lol. By the way, it struck me that this type of boat watching is the antithesis of the roaring hydroplanes that I witnessed earlier this summer. Well, what about you, anyone else like to watch the freighters? Where do you go to watch the ships pass by? Leave a comment and let me know! Since you mentioned my blog here, you know that I love to boatwatch. Probably the best spot on Belle Isle is out past the Livingstone Lighthouse or anywhere near that. You get to catch the freighters as they come in off Lake St. Clair. The best spot period is the Soo though. Thanks for the tip on where to go on Belle Isle! Your blog has some great shots of the boats. I have gotten shots from Windmill Park as well. Great information! Thanks for posting this. I was wondering where people were getting shots of the Westcott. It's been awhile since I've been to Riverside Park, I'll have to check it out. Del Ray and Belanger are new to me. Del Ray Park is just west(?) of Fort Wayne (the fort not the city) on Jefferson. Belanger is a little tougher to get to. Riverside may be closed right now but that hasn't stopped people. I seem to remember hearing that Riverside had closed (I hope it's temporary). I've been to Fort Wayne, so I should be okay getting to Del Ray Park. I'll do a google search for Belanger. I've got a project I'm working on at Belle Isle, so I'll most likely go over there again next. Appreciate the additional info! No problem....YOu should really try to get video of a thousand footer though...Now that's impressive. That definitely would make a good video!